When you choose to live at ReNew on Main you will gain so much more than just an apartment home. Our friendly staff and management team is here to help you have an unparalleled living experience. 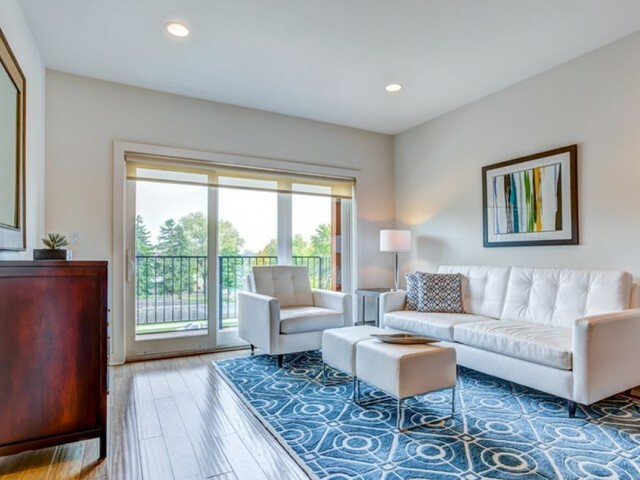 In addition to our personalized service, we offer a leading amenities package that focuses on classic comforts and the latest features and services that are revolutionizing apartment living. On-site amenities include a community clubhouse with entertainment options, resident event room, state-of-the-art fitness center, and an outdoor private plaza with fire pit. Our fitness center is open 24-hours so you can fit your workout around your schedule. Our outdoor private plaza is ideal for hosting events and includes a fire pit, grilling area, and plenty of comfortable seating. We also have a party room with a full kitchen available indoors that can be rented out for potlucks and private gatherings. Our TV lounge is a great place to relax and includes a large screen tv, game tables, and billiards. You’ll also enjoy free high-speed internet throughout our community. Call us today to schedule a tour, or apply online to reserve your spot in our community! Our state-of-the-art fitness center includes everything you will need to get in a great work out without having to leave home! Open 24 hours a day. Includes ellipticals, treadmills, free weights, and a studio space for yoga. Our private plaza is the perfect place to relax around the fire pit or enjoy an outdoor meal with the grill. Residents enjoy using our party room for building pot lucks and renting it out for private gatherings. It features a full kitchen and can accommodate up to 30 people. Our Club Lounge is the perfect place to enjoy a night in! It features a fireplace, large screen TV, game tables, and billiards. Sleek modern kitchens with ample storage and built-in appliances. All apartment homes have private balconies form 70-200 sq. ft.
Every apartment features upgraded bamboo hardwood flooring throughout the living and dining spaces.